Frogs of the family Ceuthomantidae are found in the elevated mountains and tepuis of the Guiana Shield in northeastern South America (Heinicke et al. 2009). They are small frogs (18-32 mm snout-vent lenght). Diagnostic characters include: T-shaped terminal phalanges, adductor musculature of the "S" type, lack of intercalary elements at the digit tips, paired lipid-containing protrusions of unknown function in the post-temporal and sacral regions, a very poorly ossified neurocranium, an unusually massive neopalatine bone, notched digital discs on fingers and toes, and the lack of vomerine teeth. The protrusions resemble dorsal glands but are not true glands. This family is basal within Terrarana (a clade consisting of the families Ceuthomantidae, Brachycephalidae, Craugastoridae, Eleutherodactylidae and Strabomantidae, with the latter four families recognized by Hedges et al. 2008; these families were all originally subsumed within Eleutherodactylus). 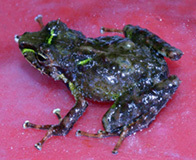 Ceuthomantid frogs are presumed to have direct development of terrestrial eggs, as do other members of the clade Terrarana. Much of their natural history is unknown. Diagnostic characters include: T-shaped terminal phalanges, adductor musculature of the "S" type, lack of intercalary elements at the digit tips, paired lipid-containing protrusions of unknown function in the post-temporal and sacral regions, a very poorly ossified neurocranium, an unusually massive neopalatine bone, notched digital discs on fingers and toes, and the lack of vomerine teeth. Hedges, S. B., Duellman, W. E., and Heinicke, M. P. (2008). "New World direct-developing frogs (Anura: Terrarana): Molecular phylogeny, classification, biogeography, and conservation." Zootaxa, 1737, 1-182. Heinicke, M. P., Duellman, W. E., Trueb, L., Means, D. B., MacCulloch, R. D., and Hedges, S. B. (2009). "A new frog family (Anura: Terrarana) from South America and an expanded direct-developing clade revealed by molecular phylogeny." Zootaxa, 2211, 1-35.